"Tree nymph" is a common name used to describe many butterflies in genus Idea and genus Ideopsis. While you are not likely to find a tree nymph butterfly in your backyard nectar garden if you live in a temperate climate, numerous types of tree nymph butterflies occur in tropical areas worldwide. The common characteristics among tree nymph butterflies are their black-and-white coloration and their delicate, fluttering flight patterns. Tree nymph butterflies prefer the tropics and occur in Japan, India, the Philippines, Indonesia, Sri Lanka and other parts of Southeast Asia. Museums, zoos and other educational institutions breed tree nymph butterflies for captive care in butterfly gardens around the globe, from Iowa State University's Reiman Gardens in North America to Europe's largest tropical butterfly garden in Zoo Emmen, Holland. Tree nymph butterflies live in forests as well as in coastal mangrove swamps. They typically live high above in the canopy but descend to ground level for mating and nectar collection. They occur from altitudes below 2,000 feet up to 5,000 and adapt to survival in either wet or dry forests. Butterfly larvae feed on green forest vegetation, and the butterflies require nectar from flowering plants. Large tree nymph butterflies, whose wingspans range from 3 to 6 inches, fall into genus Idea and include Electra's tree nymph butterflies (I. electra), Ceylon tree nymph butterflies (I. iasonia), Malabar tree nymph butterflies (I. malabarica) and giant danaine tree nymph butterflies, which are also referred to as paper kite or rice paper butterflies. Genus Ideopsis includes small tree nymph butterflies such as endangered Hewitson's small tree-nymph butterflies (I. hewitsonii) and Seram small tree nymph butterflies (I. klassika). Many tree nymph butterflies deter predators with a chemical substance known as "danaidone," which makes them unpalatable. Male butterflies accumulate the danaidone while collecting nectar from plants and pass it along to the female during mating to protect the eggs. Tree nymph butterflies are not shy around humans. Whether you view them in the wild while hiking through Southeast Asia or at a butterfly garden exhibit, they are likely to approach you and even land on your arm. The butterflies are attracted to the color red and certain chemicals in lotions and perfumes. Avoid the common mistake of confusing tree nymph butterflies with wood nymph butterflies (Cercyonis pegala), which are common North American grayling butterflies with gray, orange and brown markings. Jennifer King has written and edited since 1994, and now works as a business technical writer. Her articles appear on GardenGuides, eHow and LIVESTRONG.COM. King has a Bachelor of Arts in English, a minor in Latin American and Caribbean studies, coursework in yoga and certifications in nutrition and childhood development. 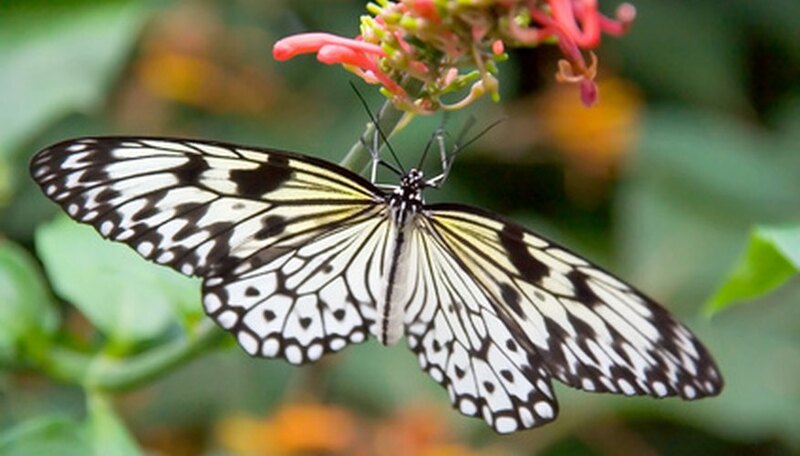 What Are the Benefits of Butterfly Gardens to the Environment?